but alas I didn’t get to sit down one-on one. 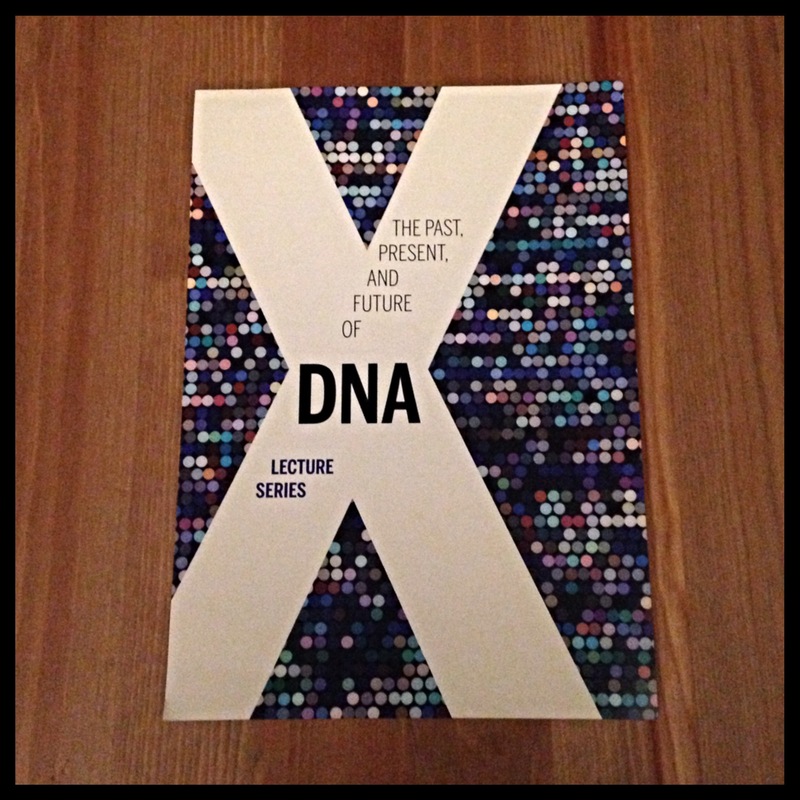 However, I did get to attend a really cool talk as part of a Radcliffe Institute for Advanced Study of Harvard University lecture series: The Past, Present, and Future of DNA. I first read The Immortal Life of Henrietta Lacks back in July of 2012, two years after its original publication and a year after it came out in paperback. Apparently this was far enough ahead of the curve that my response was the highest visited response on this site until recently. (Thanks Mr. Coehlo!) Not to be a hipster or anything, but yeah that. When I found out about the lecture from my friend Martin, I jumped at the opportunity. I remembered really enjoying the book and I knew that it had become this cultural phenomenon through book groups and word of mouth. What I wasn’t expecting was how packed the auditorium was. I’m glad I got there as early as I did because not only was the main auditorium full, but the balcony and two over-flow rooms were as well! 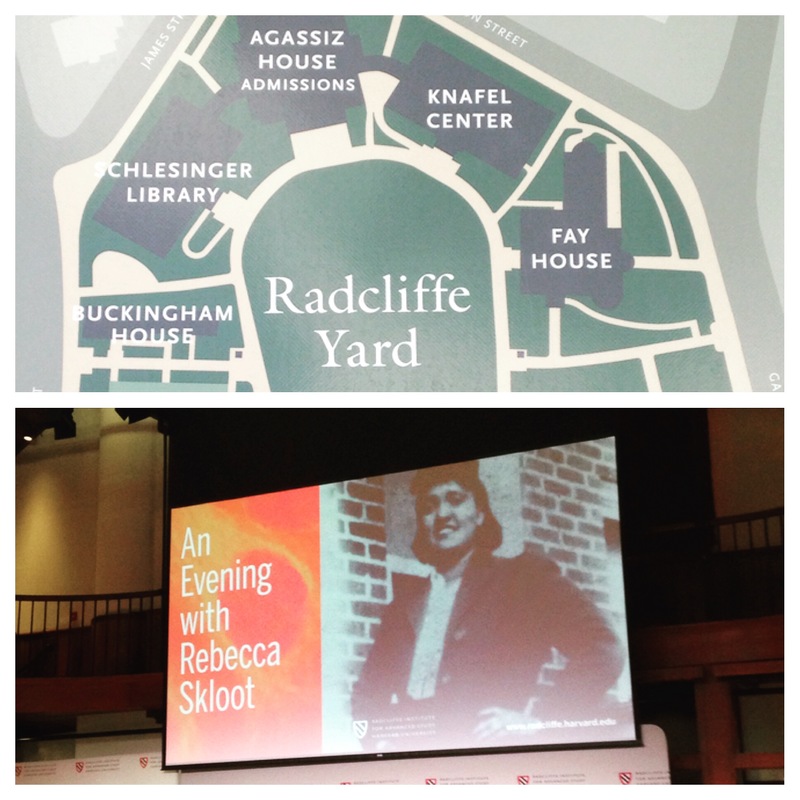 It was cool to see Radcliffe up-close and personal as I’ve only ever walked around/by it and never walked through the grounds, unlike the main Harvard campus. 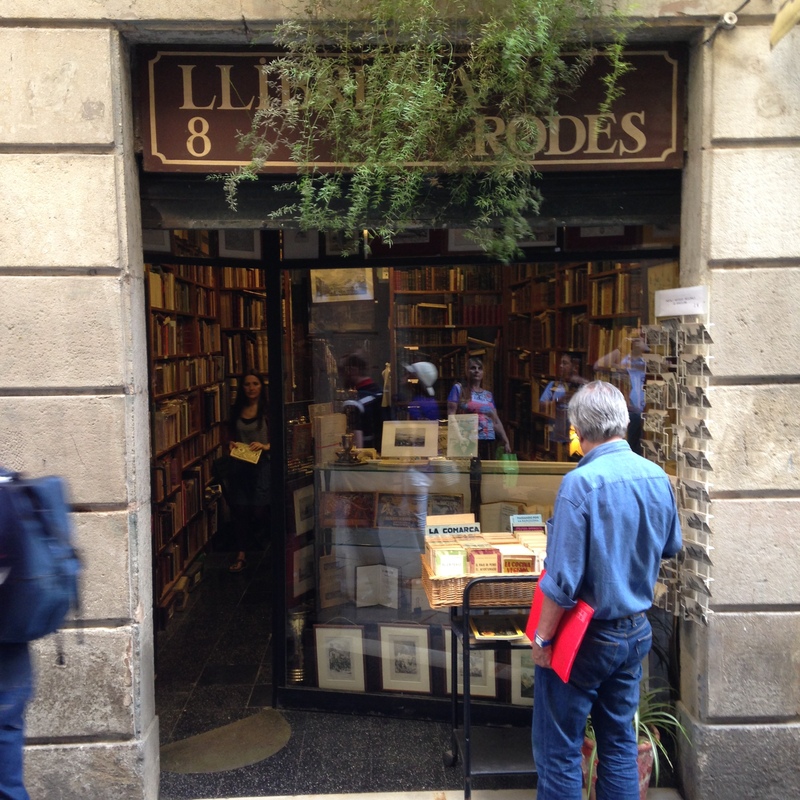 In case you missed it, I went to Spain last month (scroll to the end for some GREAT panoramas). I was there for two weeks and it was wonderful. I’m still working on a “recap” post which will probably just be a link to my photos and a list of everything we did. 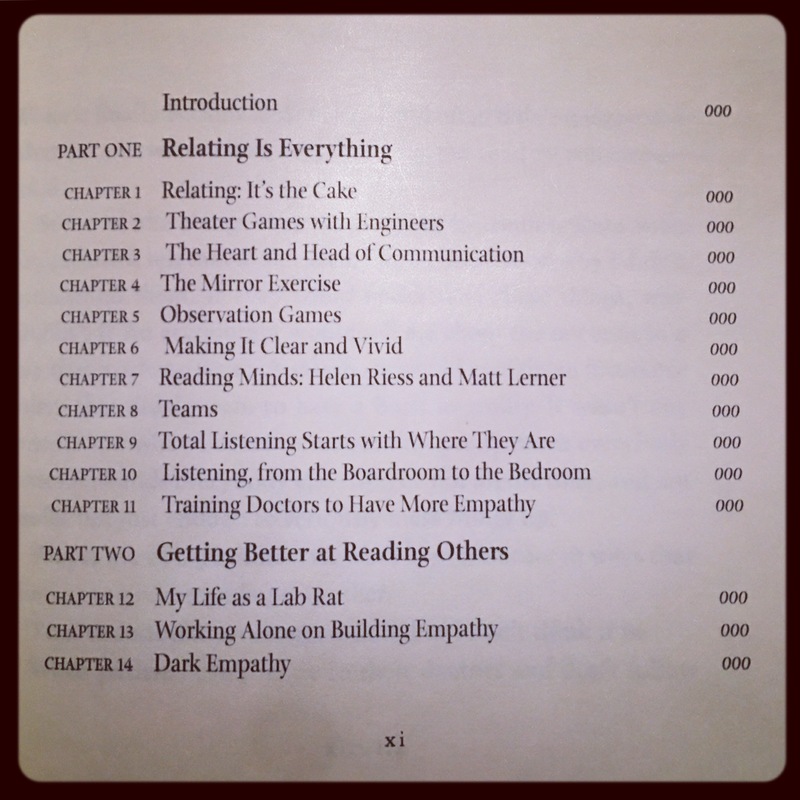 The plus side is that you, my lovely book lover friends, get to have a special post made just for you! 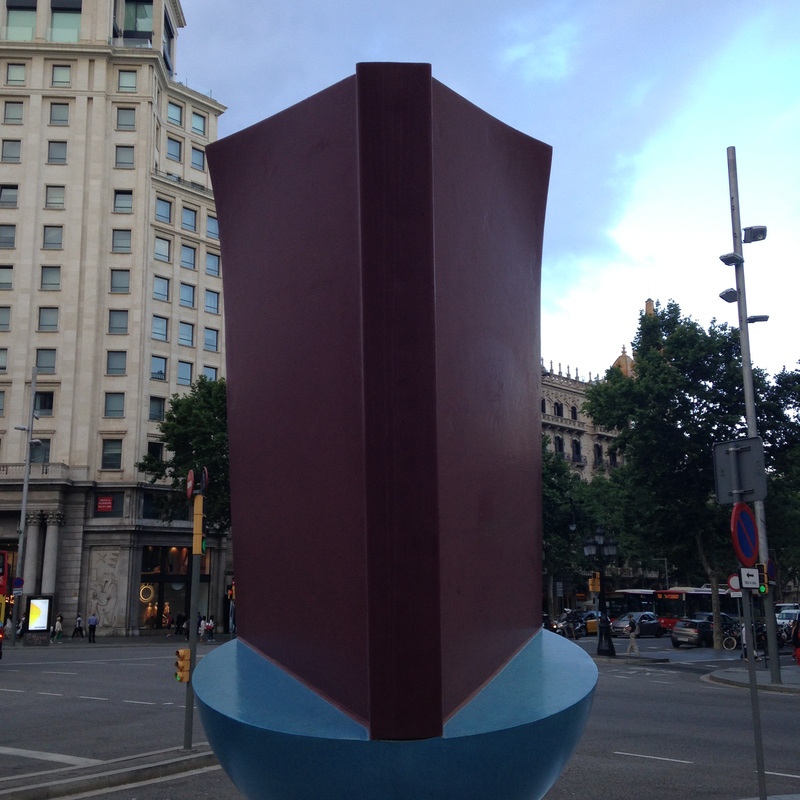 To kick off, here’s a photo of the Monument al llibre statue by Joan Brossa (Wikipedia link) we stumbled across in Barcelona. Here’s a different angle. 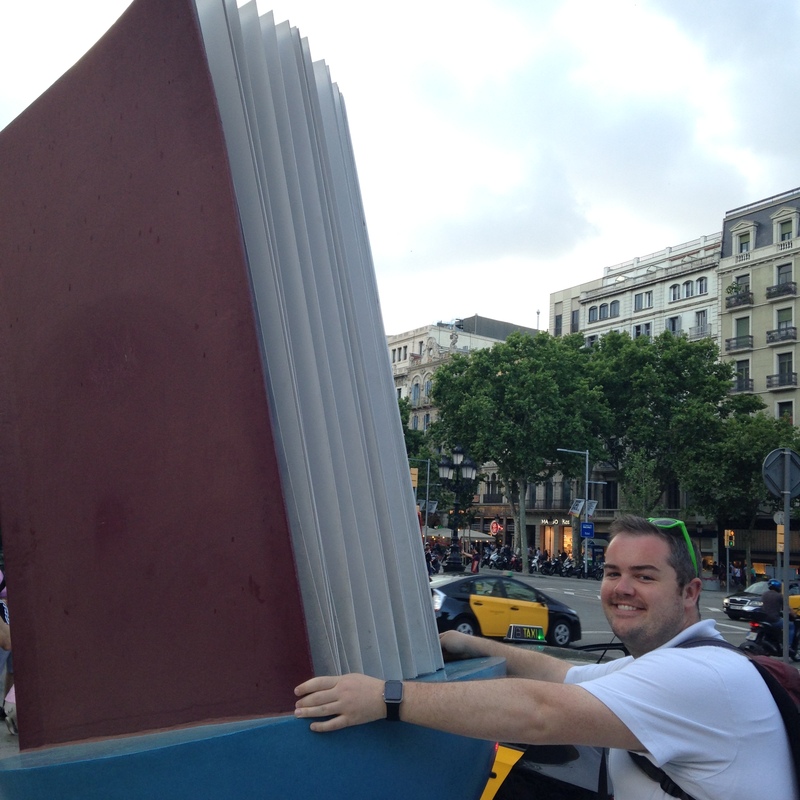 Overwhelmingly our bookish adventures were in Madrid. I’m sure this is because I planned Madrid and Tim planned Barcelona, but that’s just how it fell. If you’ve followed this blog for a while you might be aware I can read Spanish, or at least eek my way through it. I’ve wanted to improve on my speaking and reading of Spanish ever since I realized I was starting to lose it, but haven’t had much opportunity (aka I’m lazy). What I didn’t know was how all-pervading Cervantes’ was to the city of Madrid and the country of Spain. Seriously, I mean sure I knew going to Madrid I wanted to visit the statue of Don Quixote and Sancho Panza in the Plaza de España, but I didn’t know I would see Cervantes or Don Quixote (Part 1 & Part 2) EVERYWHERE. 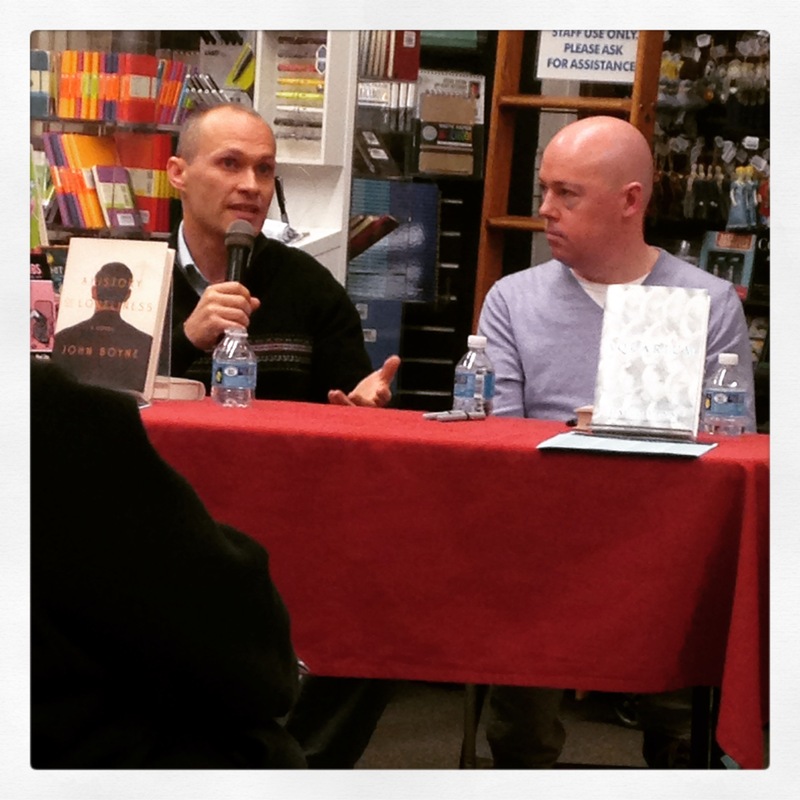 David Vann, left, and John Boyne, at Harvard Book Store. Monday night, I had the pleasure of attending a reading at Harvard Bookstore (Shop Local!) featuring John Boyne, of The Absolutist fame, and David Vann, whom I haven’t read yet! It was an enjoyable event and both novelists’ new works, A History of Loneliness and Aquarium respectively, sound fascinating! (I will definitely request them from my local library in the near future.) Boyne’s humility impressed me and I was glad to see him shift focus to Vann when everyone kept asking him questions. While there, I took the chance to get my copy of The Absolutist signed (SWOON!) and that photo is at the end of this post. Did you know that it was his favorite as well? I nearly hyperventilated (and actually clapped out loud like an awkward lunatic) when he said that and immediately messaged Heather (who is getting a signed copy of a surprise book). When John, first name basis obviously, signed my book I told him how Heather and I are still getting a lot of traffic from our responses to The Absolutist and that I got a long email just last week about it. He commented that he was always fascinated about how long a story can continue to gain traction. I don’t care what people say. I love J.K. Rowling. She is a skilled story-teller and talented writer. With the two types of reactions most people have when they hear her name, it’s easy to see why she wanted her name kept far from her works as Robert Galbraith. Unfortunately, this didn’t happen, but this was a bonus for those of us who would never have discovered them. And she’s back! Now don’t get me wrong, Markinson (TBM)’s last novel, Marionette, wasn’t bad and was excellently written, it just wasn’t for me. However, Confessions from a Coffee Shop harkens back to A Woman Lost in humor and fun! I flew through this and couldn’t help but smile the entire time I read this novel. I received a copy from the author and received no compensation for my response. If this review sounds at ALL interesting you should request a preview copy from her here. I said above that TBM is back and the reason I say that is because she’s return to what she knows and what I can assume is a comfort zone for her. I don’t fault her one bit for stretching her writing muscles in her second novel, but I’m so glad she returned to her strengths!